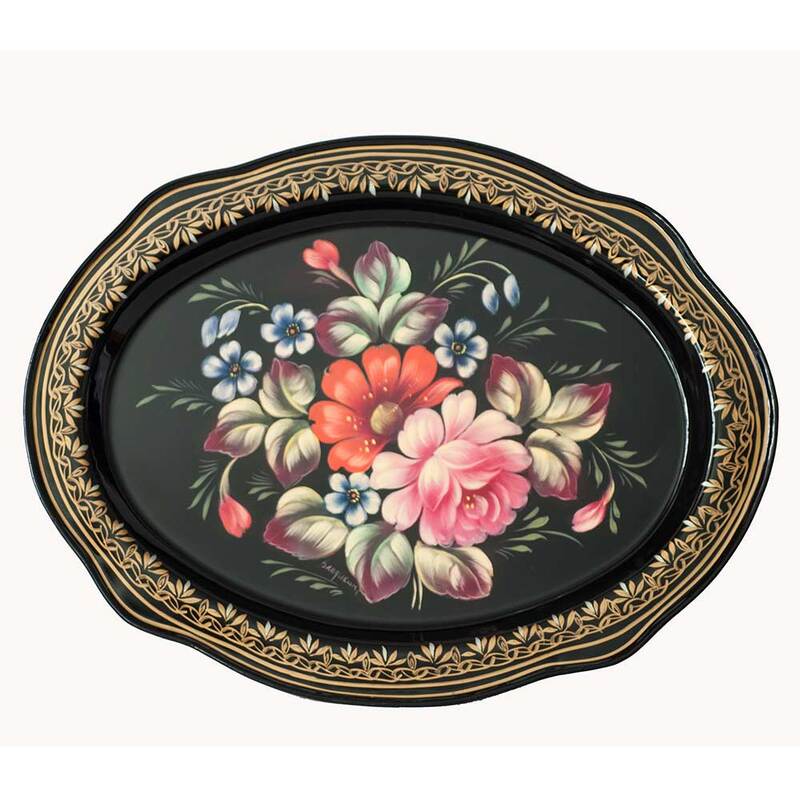 Zhostovo is a world-famous Russian folk art center popular for its painted trays decorated with bright bunches of flowers on the black background. 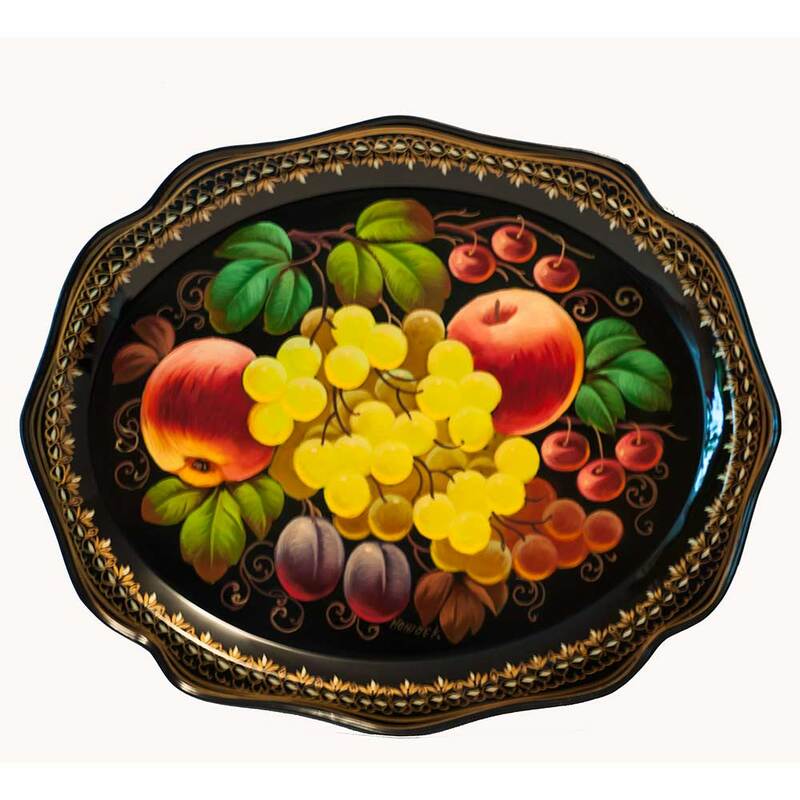 The skillful and talented masters of Zhostovo have turned these domestic utensils into real masterpieces of art. 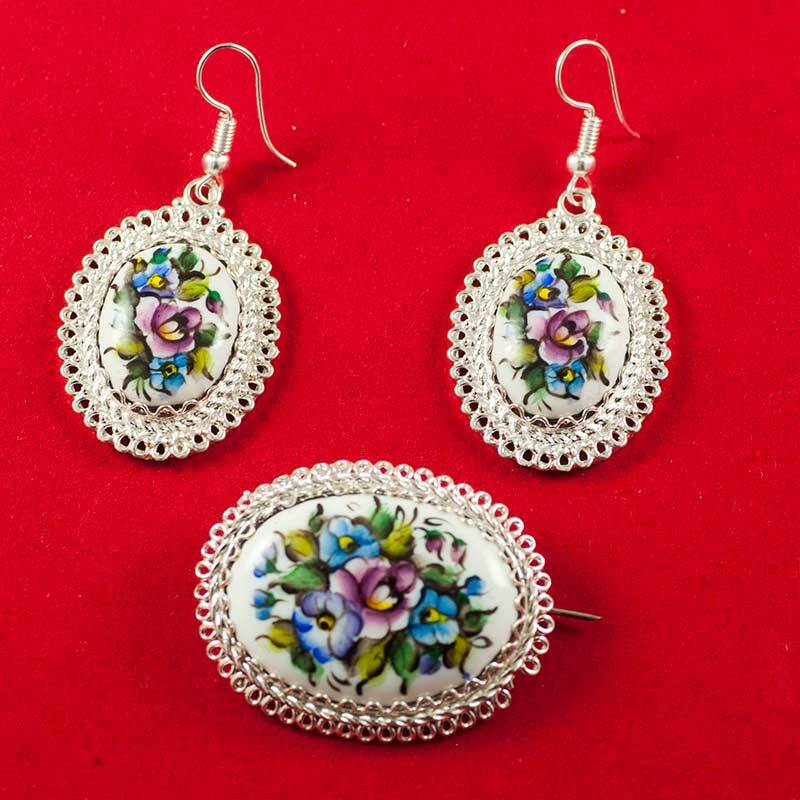 The best traditions of this popular folk art are preserved by modern artists of Zhostovo, who manage to unite the traditional methods with improvisation and individual talent of each master. 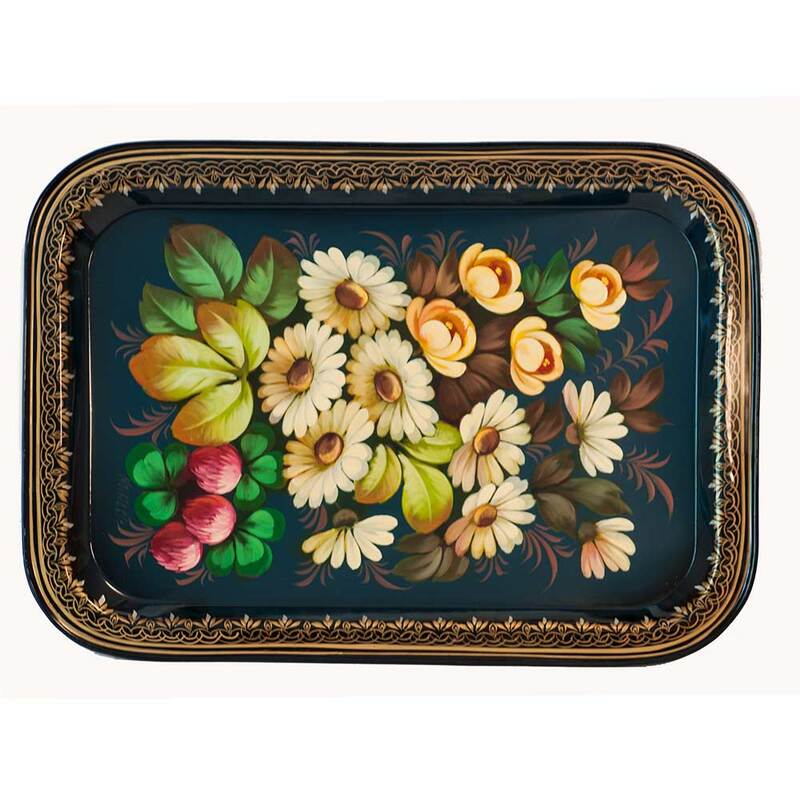 You'll always can recognize Zhostovo style painting by bright flower compositions on lacquered metal trays. 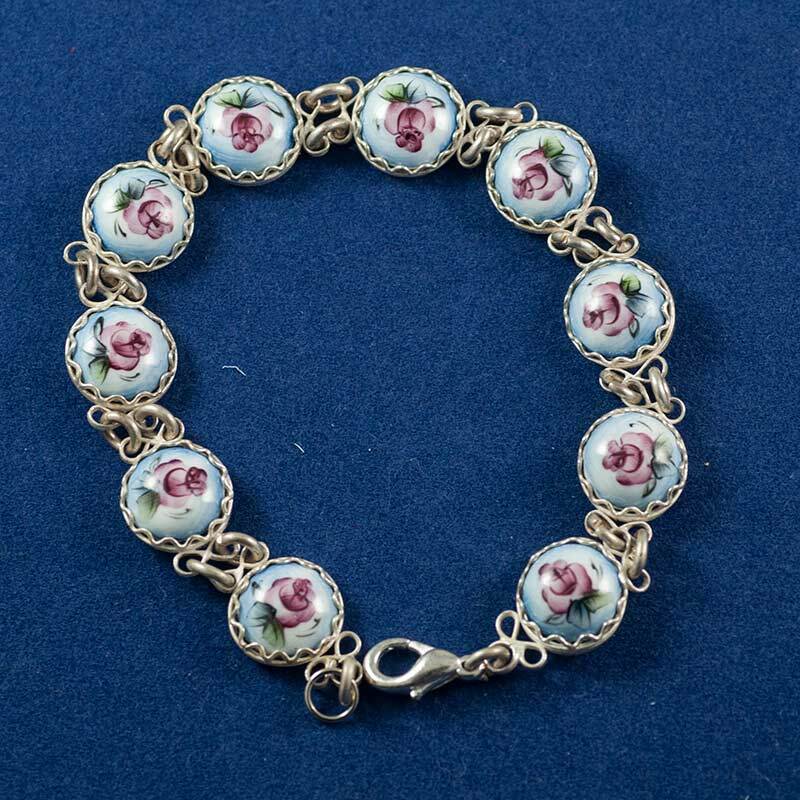 The trade in Zhostovo started in 1825 from the first private works of Osip Vishnyakov in the village of Zhostovo. 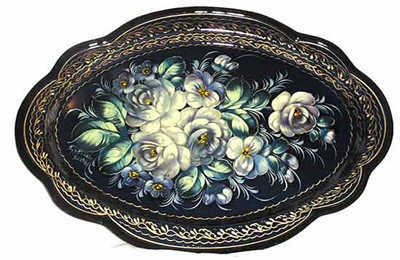 First trays were made from papier-mache. 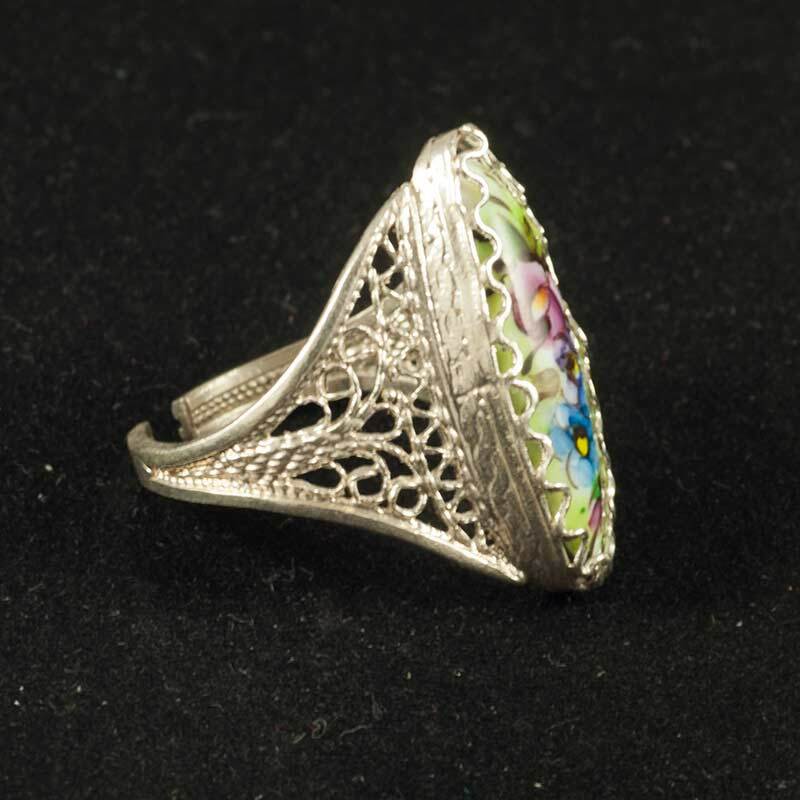 Starting from 1830 they started hand-forging the tray bases from metal. 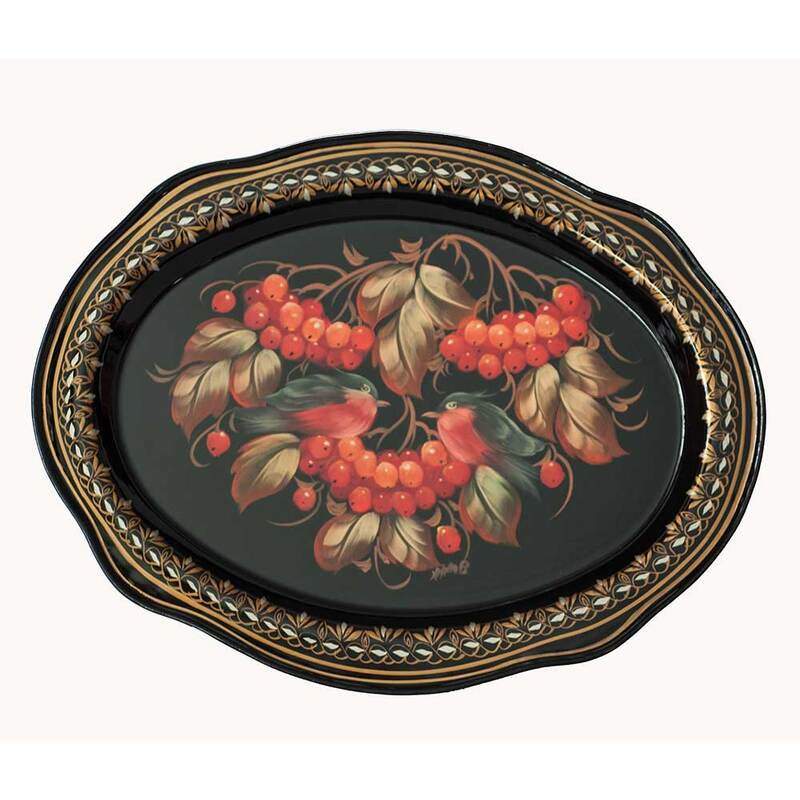 Decorative trays weren't novelty to Russians of 19th century. 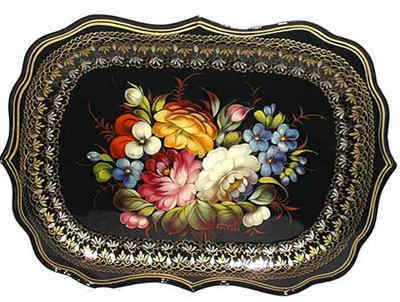 Such trays were in use from 18th century. 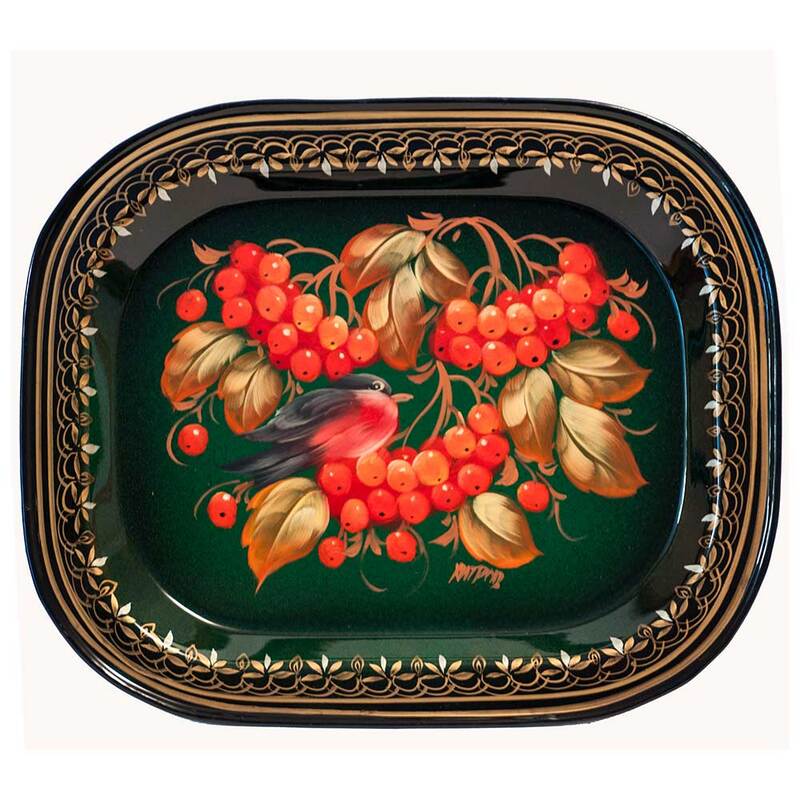 The earliest trays that survived the hardships of life are dated 1870. 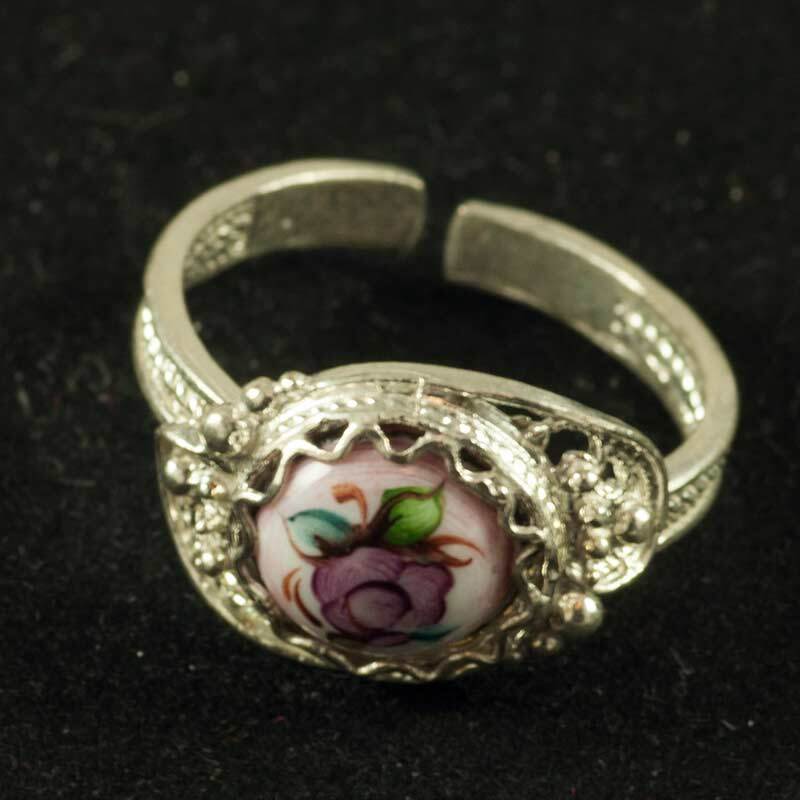 The exact dates of manufacture were stamped on the backs of trays. 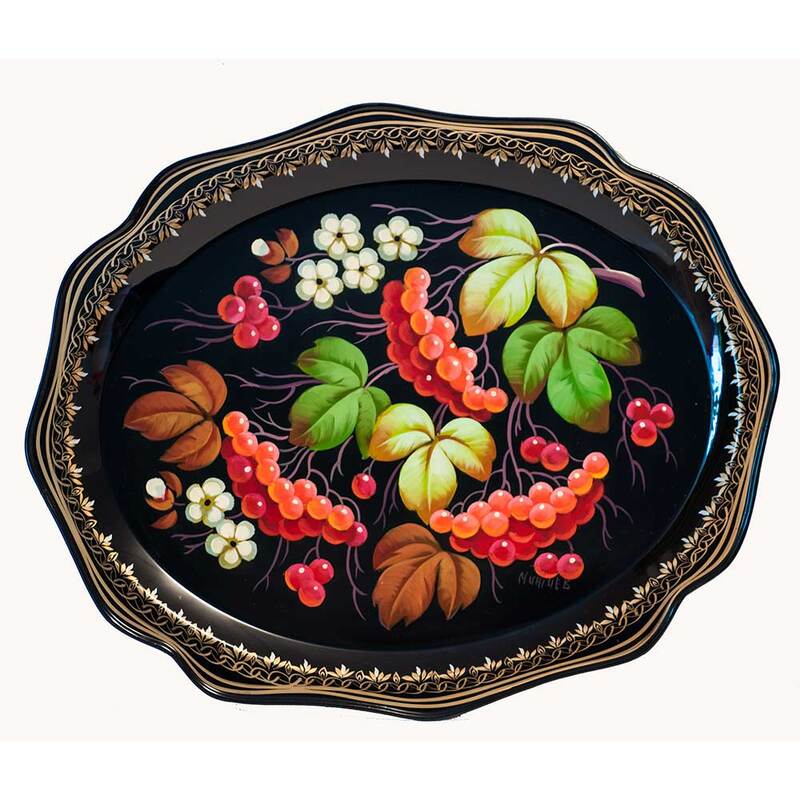 Most of these trays were made by Vishnyakov dynasty. 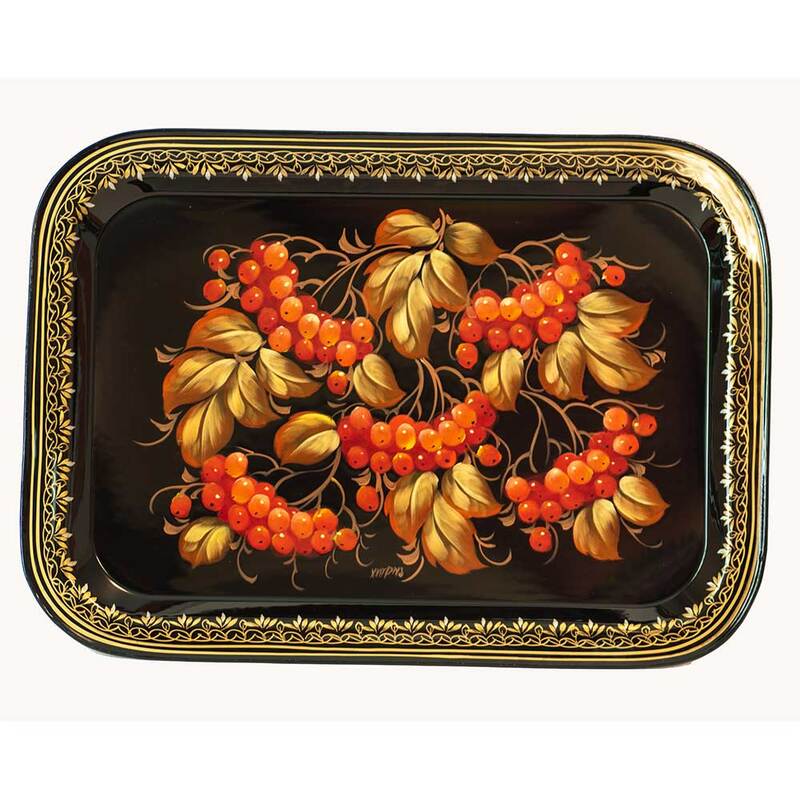 The trays were popular in Moscow, St. Petersburg, Nizhny Novgorod. 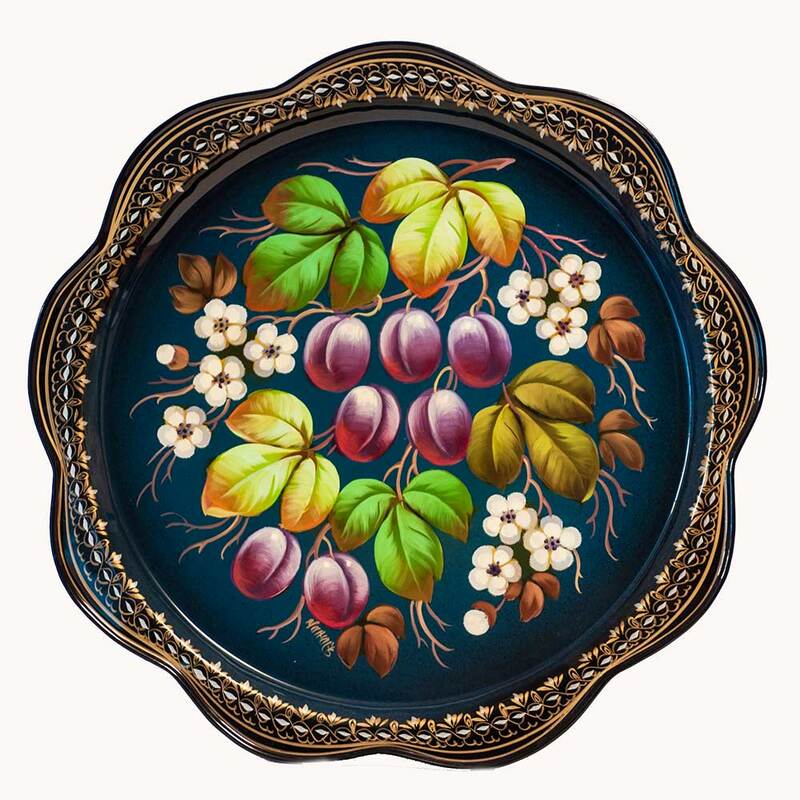 Not only flowers were depicted by artists of Zhostovo but fruit, landscapes and folk scenes. 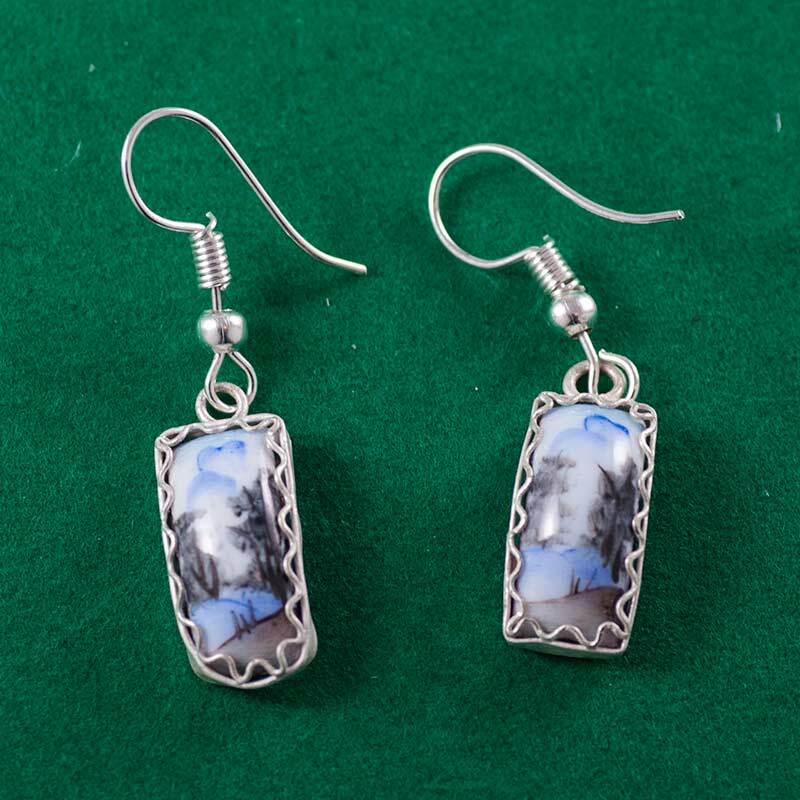 Up to these days our art stays purely decorative. After Russian October revolution in 1928 Zhostovo artists united under cooperative "Metallopodnos". Thus started a new stage in trade development. 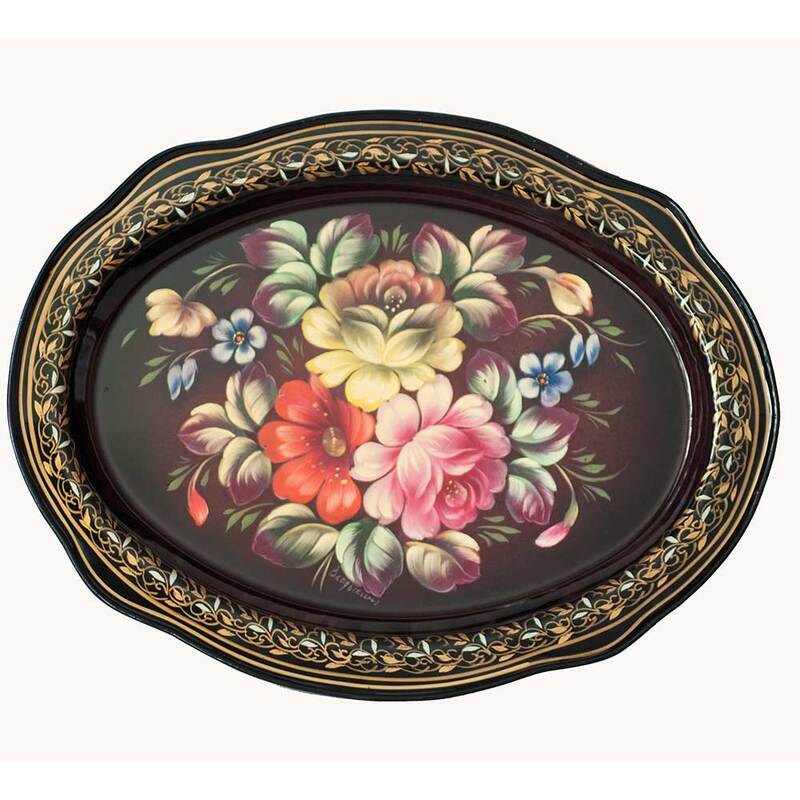 Zhostovo decorative art manufacture was founded in 1960. Today it employs 240 artists. These people held tight bonds with traditions of the past. "Look closer into these ornaments and, I can assure you, you'll get the feeling to be compared only with music." Zhostovo artists begin their apprenticeship at the unbelievable age of 2 years. Children are given brushes, oils and materials at such an early age, to introduce them, through play to the wonders of art. The children whose talent shines through are then given the attention and guidance to develop their talents to the fullest. 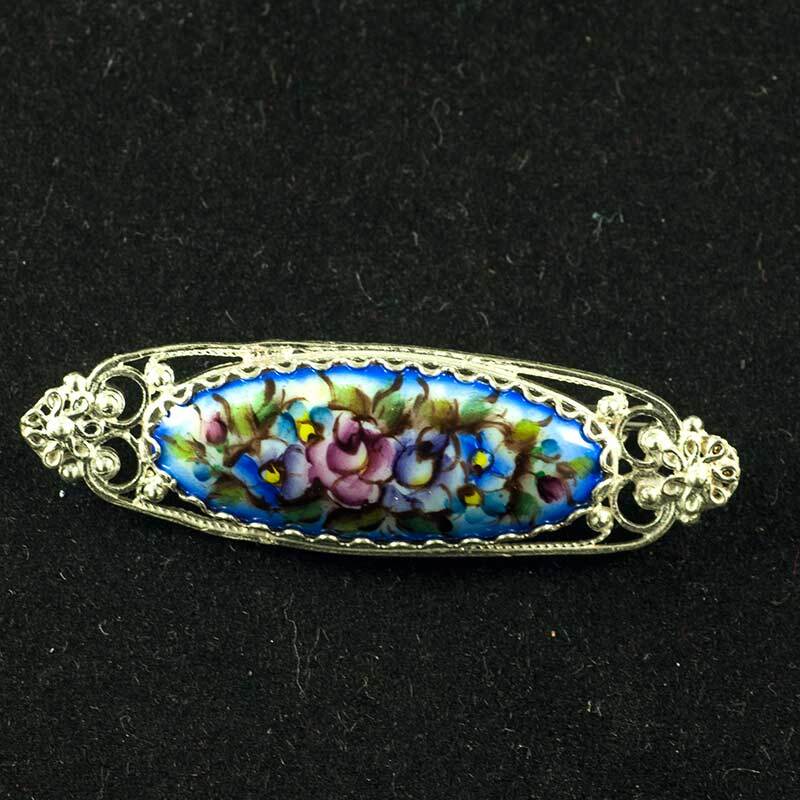 The edges of the metal trays are all hand turned which apart from enhancing the appearance also adds strength to the tray. 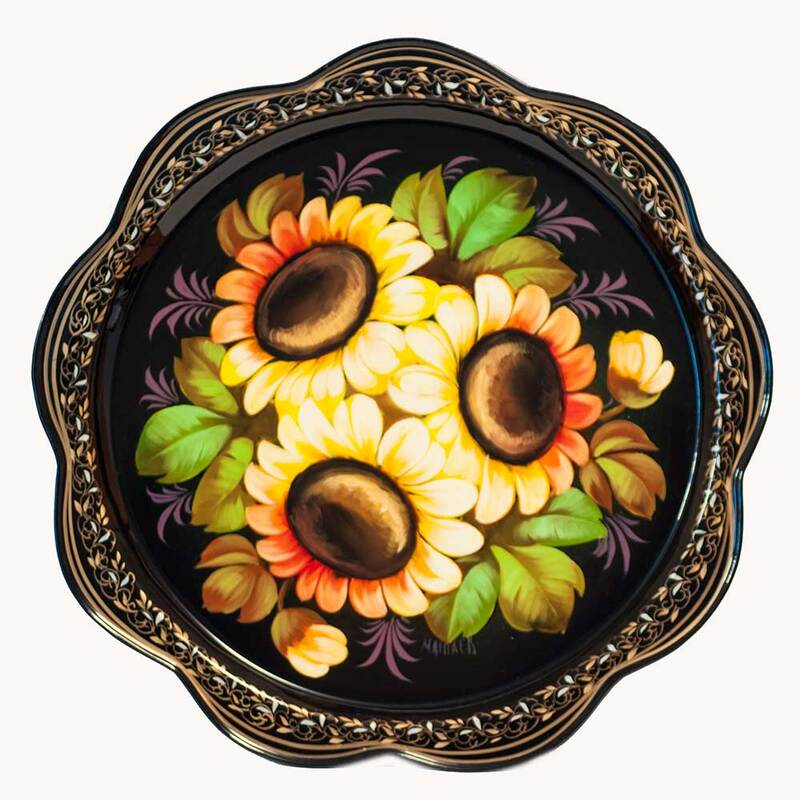 Zhostovo masters are known for their individual style of painting and the extraordinary composition of the flowers they create. 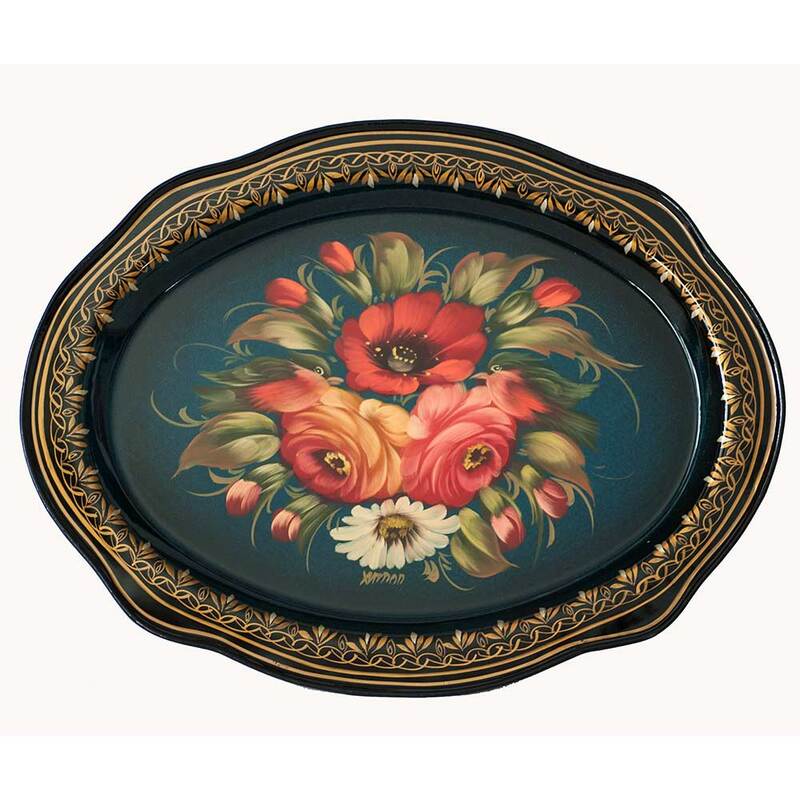 Every single tray is a hand painted direct from the eye and the heart, with no stenciling or guides lines to work from and then signed by the artist a complete original one of a kind work of art. 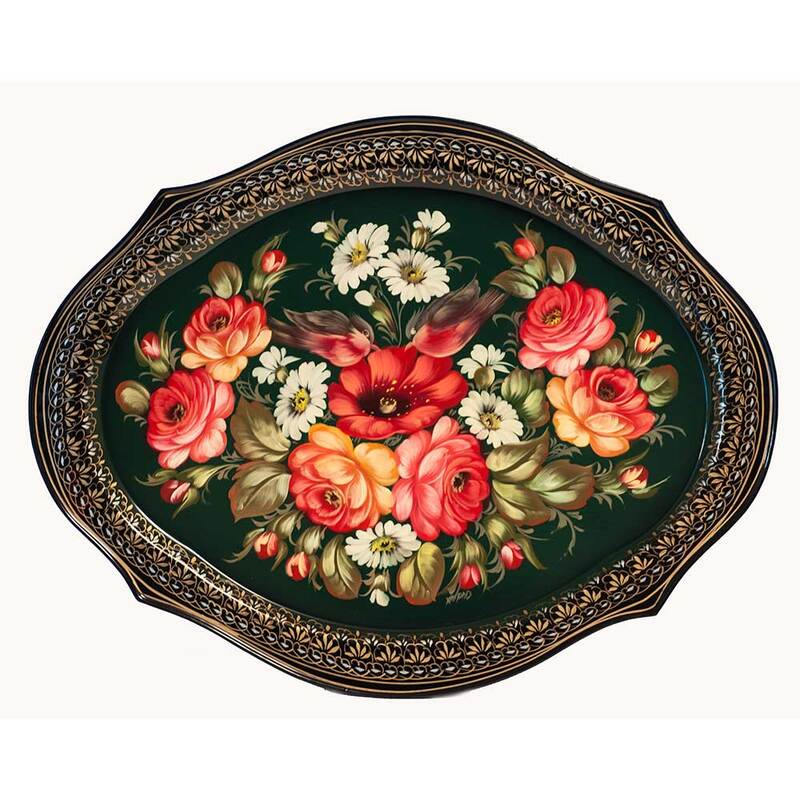 Although the artistic structure and composition of other trays may be similar. The artist intentionally paints a different and individual masterpiece each time. 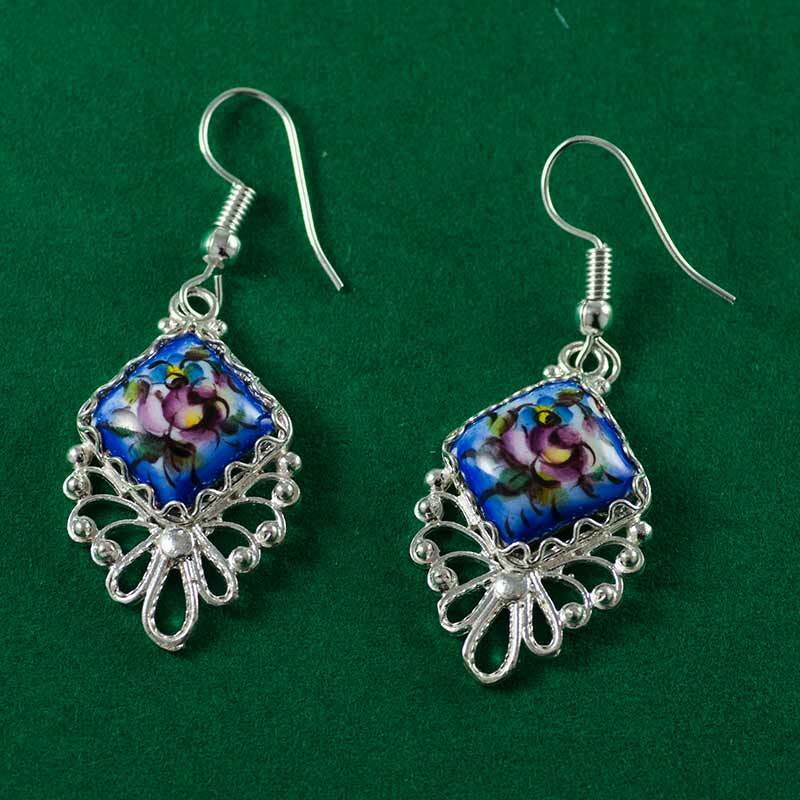 Zhostovo masters are complete in their knowledge of the flowers biological structure but purposely mix the true life forms with a hint of fantasy, giving us the incredibly beautiful creations that the masters of Zhostovo produce. Silhouettes of floral bouquets were based or sketched freehand with whitened or silvery oil paint over several layers of a lacquer colour. Oval leaves and flowers organized into a balanced composition with the use of energetic and rhythmic brushwork set the stage for the beauty to come. When dry (step two)...transparent oil colours were applied to shadow areas after a thin film of linseed oil was rubbed over the entire piece to allow for the easy movement of paint colour and to increase the transparency of that colour. 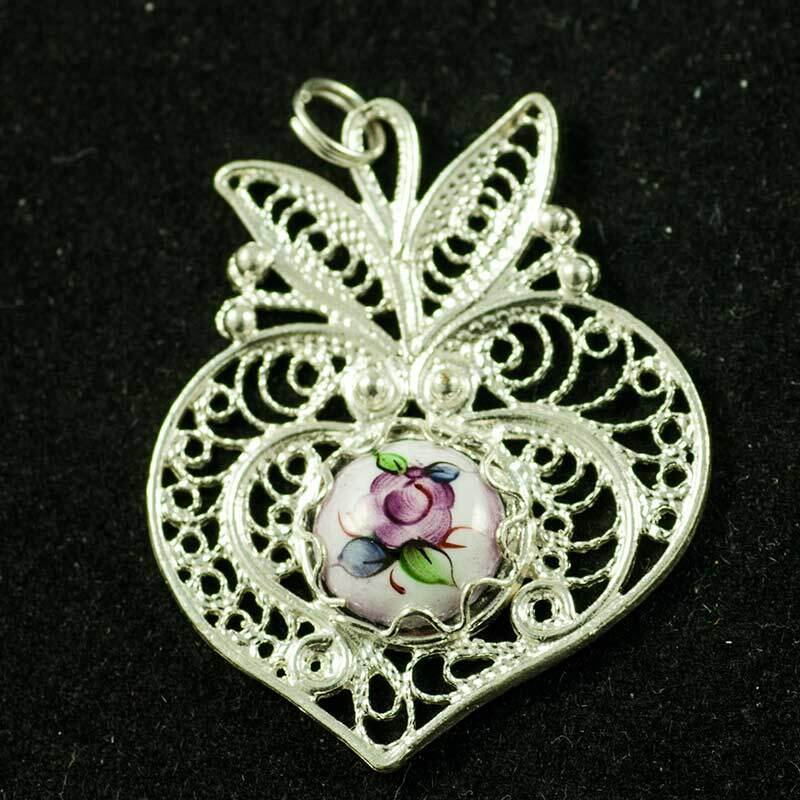 Usually the part of the leaf or flower closest to, or facing the centre of the bouquet was left the lightest. Again, after drying, (step three) the linseed oil and shadows were re-instated and the important layers of strokes to highlight and define the shape of each leaf and flower were begun. Lightening the paint colours, and painting into the wet transparent shadow colours created the consistent change from light to dark. 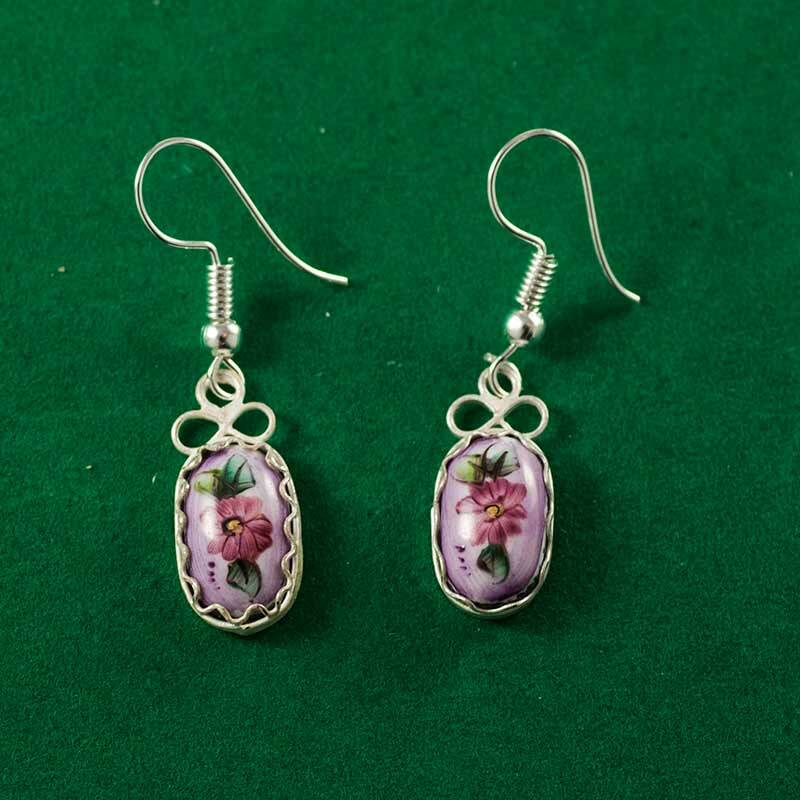 Changing from one colour to another, creating contrast and/or harmony the floral composition took on shape and excitement. Detail work in the flower centres, linework through and around leaves, sprays of grasses, buds, seeds and tendrils, were added as finishing touches, with a very quick and light touch of subtle colour with what we would call a liner brush. 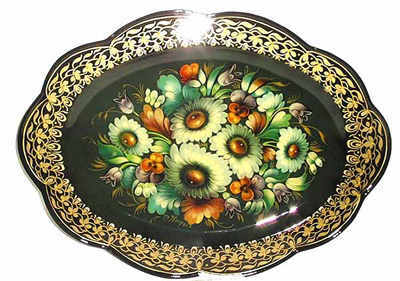 The borders, executed usually with gold paint, using many groupings and arrangements of strokes, sometimes lavish, and other times simply stated, in conjunction with flowers and/or leaves, finish the Zhostovo look. Today, the work of the Zhostovo Masters is exhibited worldwide. 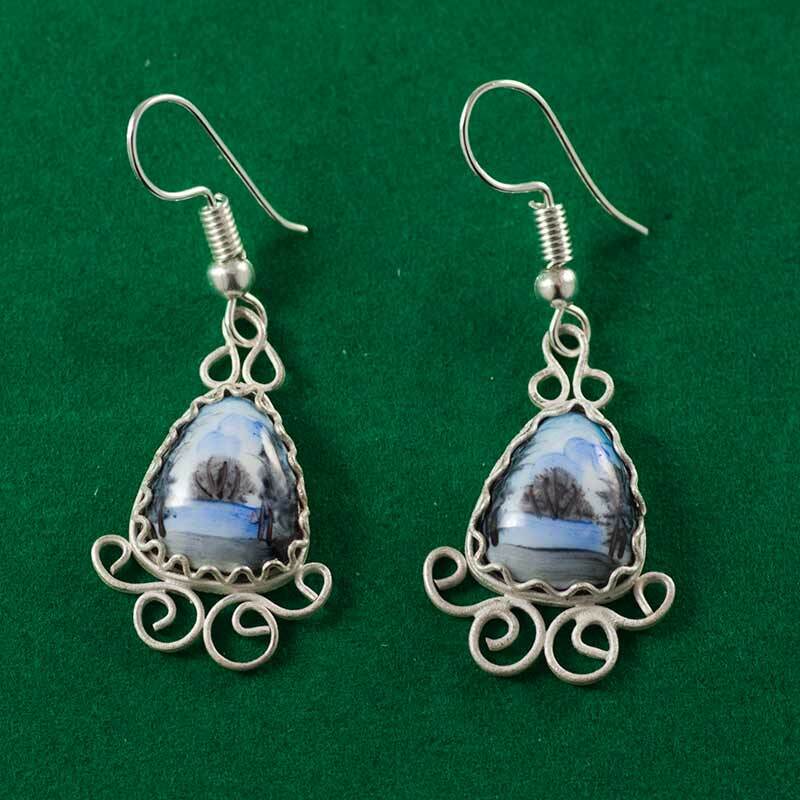 Through many hours of study with family members, the Fedoskino Art School, with Zhostovo Masters, and in the factories, painters develop their skills. 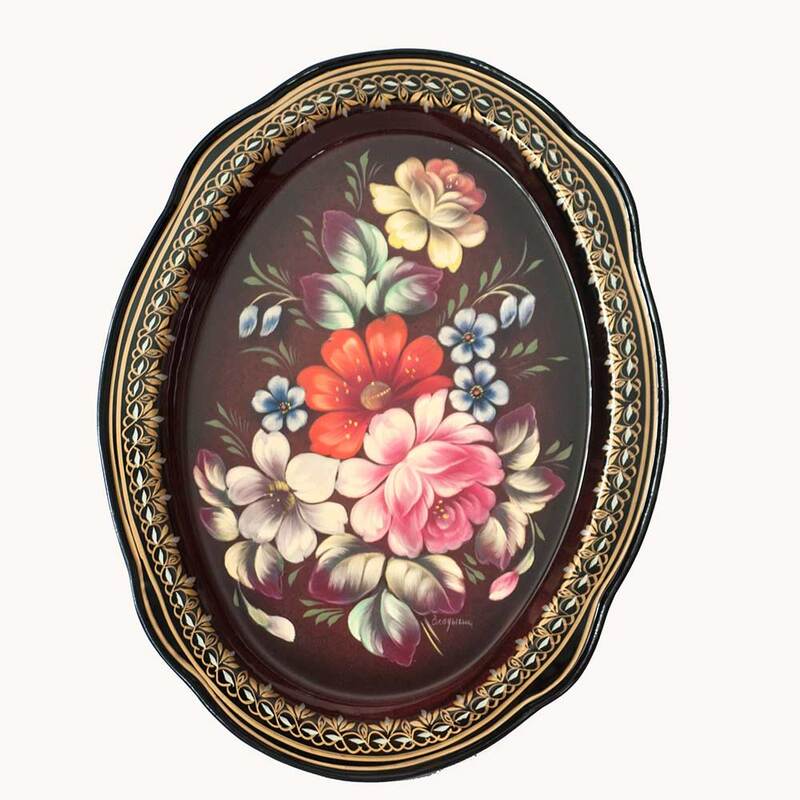 Patterns and instructions with Zhostovo like floral are available to paint in both oils and acrylics. My personal preference is to use oils, or alkyds, with the linseed oil, or liquin so that the important transparent layering of colour can be achieved. I use Alizarin Crimson, Paynes Grey, and Sap Green as my shadow colours. These closely duplicate those colours used by the Zhostovo artists. Cadmium Red, Cadmium Yellow Medium, Ultramarine Blue, Viridian and White complete my palette. Developing brush control/techniques, losing your fear of colour, and watching your very own creative juices bubble to the surface as you paint, are valuable and rewarding lessons to be learned as you endeavour to master this technique. The emergence of depth and the systematic development of contrast urge you on.......and cannot help but have a positive influence on all of your future painting. 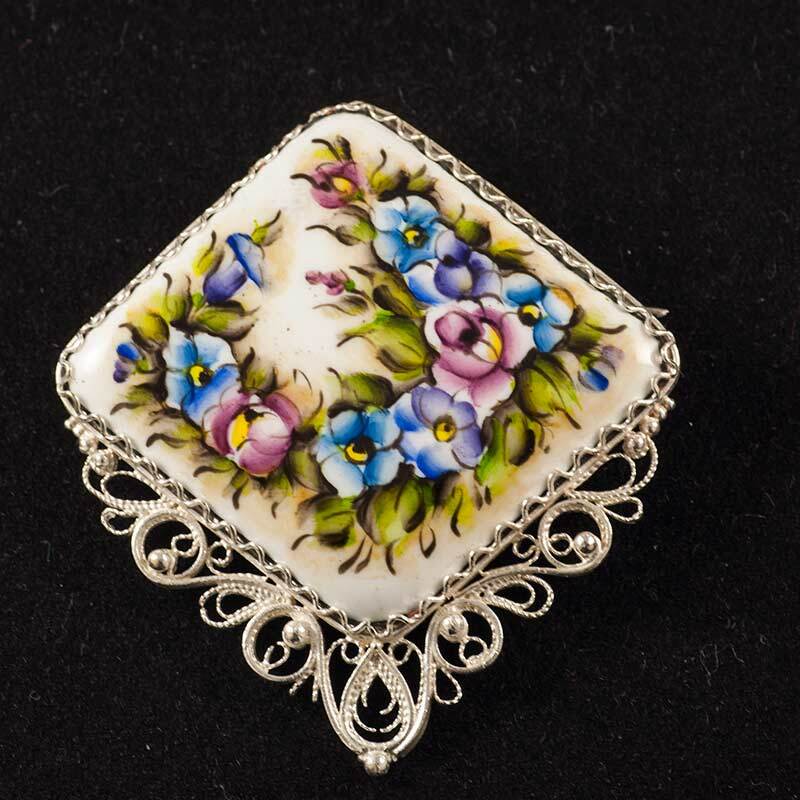 The trays can be used functionally and can be cleaned with liquid soap and other cleaners care must be taken not to scratch the surface and the beauty of the art will remain forever. 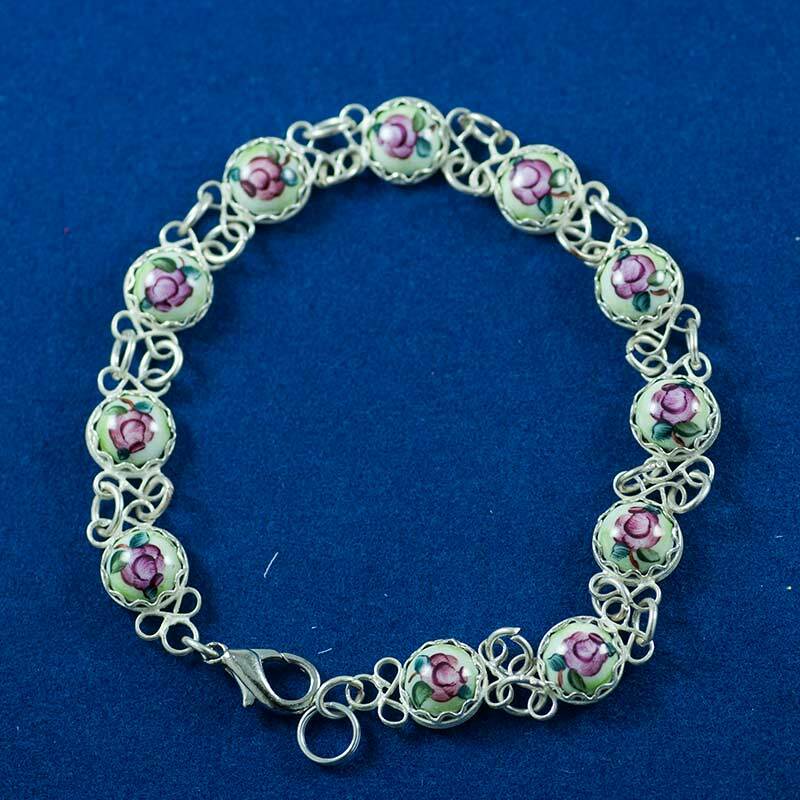 Nowadays the works of Zhostovo artists are on display at various exhibitions and museums not only in Russia, but in many other countries of the world. Nowadays the works of Zhostovo artists are on display at various exhibitions and museums not only in Russia, but in many other countries of the world.